Copyright: © 2018 Naclerio C, et al. This is an open access article distributed under the Creative Commons Attribution License, which permits unrestricted use, distribution, and reproduction in any medium, provided the original work is properly cited. Potassium is an important ion capable to maintain intra-extracellular electric gradient. Variations in the intra-extracellular ionic flow may alter cells functions, skeletal and smooth muscle contractility and electric activity of myocardial cells. In this study we demonstrated that high level of serum potassium may be associated with cardiac and neurological life-threatening diseases. We describe two case reports in which one patient, chronic hemodialysed, presented with cardiogenic shock in setting of hyperkalemia; the other, with end-stage kidney disease, showed a flaccid paralysis associated to high level of serum potassium during potassium sparing diuretic therapy. Emergency haemodialysis was performed with a complete remission of the clinical manifestations. Indeed, the use of simply diagnostic instruments such as serum electrolyte assay and electrocardiographic study (ECG) are helpful in clinical practice solving in timely serious complications due to hyperkalemia. Potassium, an important cation in the intracellular environment, has a concentration gradient depending distribution across the cell membrane and responsible for membrane transfer of ions and muscular excitability . The steady-state ratio of intra and extracellular concentrations is regulated by two mechanisms: Na+K+ATPase and K+ membrane permeability; the former determines active counter gradient flow of potassium in cells; the latter regulates the membrane potential. Hyperkalemia causes changes of intra and extracellular K+ ion concentrations resulting in inactivation of Na+ channels, K+ outflow alteration with consequent variations of depolarization threshold. The degree of depolarization is related to serum level of potassium and induces membrane depolarization leading to involuntary muscle contractions as “fasciculations” which induce a flaccid paralysis . When the same process affects cardiac muscle fibers it results in important and potentially fatal arrythmias . Hyperkalemia can be difficult to diagnose clinically because symptoms may be vague. Patients may be asymptomatic or report nonspecific symptoms such as generalized fatigue, weakness, paralysis or palpitations. Hyperkalemia is suspected in any patient with a predisposition towards elevated level of potassium such as in following conditions: acute or chronic renal failure, trauma leading to rhabdomyolysis, ingestion of foods high in potassium, medications, and catabolic states. In Emergency Medicine hyperkalemia can lead to sudden death from cardiac arrythmias, any suspicion requires an immediate electrocardiographic study (ECG) to evaluate whether electrocardiographic signs of potassium imbalance are present. We describe two cases characterized by atypical clinical presentation; the one with cardiogenic shock and subsequent particular arrythmias; the other with neurologic manifestations and electrocardiographic alterations in the presence of high level of potassium. A 70 year-old Caucasian men was admitted to the Emergency room in state of shock. At presentation, he showed pallid, cold and sweaty skin, a filiform pulse with a pulse rate of 150 b/m, central pulse rate of 150 b/m and the value of blood pressure measurement < 80/50 mmHg. ECG showed wide QRS complexes (QRS 0.20’’) with a pulse rate of 140b/m. AQRS and a QRS sinusoidal pattern consistent with ventricular tachycardia. The increased duration of QRS and the sinusoidal pattern of QRS complexes were suggestive of ventricular tachycardia. 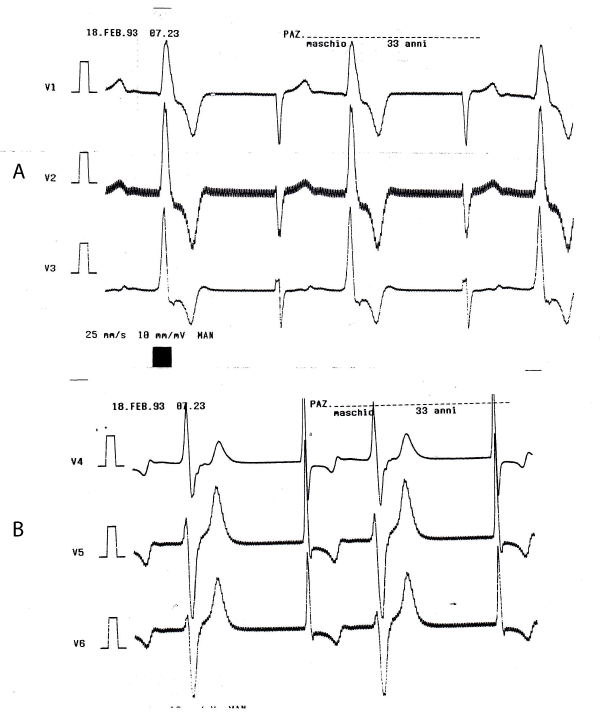 The arrythmia relapsed twice: the first episode had five minutes duration and was followed by junctional escape rhythm, no atrial activity and the onset of ventricular bigeminy (Figure 1a). Wide QRS tachycardia recurred after 30 minutes, followed by haemodynamic worsening. Electric cardioversion was not carried out because due to suspicion of hyperkaliemia, there was high risk of post cardioversion ventricular arrest. Emergency haemodialysis was performed; ECG showed nodal rhythm with a pulse rate = 40 b/m which gradually increased (Figure 1b). Laboratory tests showed: K+ = 9.3 mmol/L, Na + = 135mmol/L, creatinine = 1.0 mg/dl, blood urea nitrogen = 250 mg/dl, blood gas analysis testing showed: pH = 7.29, pCO2 = 32mmHg, PO2 = 95mmHg. After haemodialysis, sinus rhythm recurred, haematological parameters restored and K+ was 5.5 mmol/L. The patient was discharged after 48 hrs, in an excellent clinical condition. ECG showed left ventricular end-diastolic diameter of 58 mm, EF of 55%, interventricular septum of 14mm, left atrium of 42 mm, moderate mitral regurgitation and an altered left ventricular relaxation pattern. A 84 year-old men was admitted to the Emergency room showing flaccid paralysis with predominant involvement of the upper limbs. The patient was affected by chronic atrial fibrillation and had an aortic mechanical prosthesis. He was treated with spironolactone because he had moderate chronic renal failure. Clinical examination, haematological tests and laboratory tests were carried out. ECG showed wide QRS complexes caused by a delay in ventricular conduction tissue (QRS = 0.16’’), a heart rate of 75/bm, whereas P waves were absent. Biochemistry showed: K+ = 9.4mmol/L, Na = 136.3 mmol/L, blood urea nitrogen = 142 mg/dl, creatinine = 1.9 mg/dl. Brain computed tomography was negative for ischaemic and/or haemorragic disease. The patient was treated with insulin, glucose, calcium gluconate and furosemide. After two hours, high K+ level persisted andurgent haemodyalisis was performed. After 4 hours K+ value was 5.5 mmol/L, flaccid paralysis regressed and ECG showed atrial fibrillation, a pulse rate of 85/min, incomplete left bundle branch block and left axial deviation. Echocardiography showed normal function of aortic prosthesis, left ventricle end-diastolic diameter of 55mm, EF of 50%, left atrium measured 55mm; absence of thrombi, IVS of 15mm; absence of pericardium effusion and aortic transvalvular gradient of 20mmHg. Both cases show that variations in serum potassium concentration can affect both the cardiovascular and the nervous systems. ECG is an important instrument for initiating prompt treatment; on the other hand, in the presence of neuromuscular disorders, electrolytes assay is very important to establish the correct diagnosis and relevant treatment. Arrhythmia in the setting of K+ values between 5.5 and 7.5 mmol/L is a rare event. K values from 5.5 mmol to 7.5 mmol/L are characterized by high, sharp and often symmetric T branches with a narrow basis. In many cases a “tent shaped” T wave pattern with a narrow basis (a short QT) is more common any K value alteration. T wave inversion can be detected in physiological conditions such as in young subjects and in pathological conditions, such as ischaemia/strain induced . Higher K+ values (from 7.5 to 10mmol/L) are characterized by atypical ECG changes as P wave widening, PR lengthening, absence of P wave in the presence of “atrial paralysis and sinoventricular conduction” disturbance . K+ values = 10mmol/L can present a diffuse and wide QRS complexes and may induce ventricular arrythmias as flutter, ventricular fibrillation, idioventricular rhythm and asystole. Second or third degree atrio-ventricular blocks are very rare. In vivo experiments showed that TV occur as a result of a rapid increase of K+ serum values; a slow increase induces slow idioventricular rhythm and asystole [6,7]. Case 1 ECG showed ventricular flutter, a rarely observed type of arrhythmia and rapid progression towards ventricular fibrillation. Extreme aberration of QRS did’nt became manifest only since intercritical ECG showed QRS = 0.12” with an idionodal escape rhythm. In the presence of malignant ventricular arrythmias electric cardioversion and/or antiarrhytmic drugs are not advisable because of the high risk of post cardio version irreversible asystole. In suspected cases immediate treatment should be given to reduce risk. Case 2 showed ECG pattern consistent with hyperkalemia (diffusely wide QRS, “tent shaped” pattern T waves, flat, wide and scarcely visible P waves). The case was unique because the patient was on chronic atrial fibrillation temporarily shifting towards sinus rhythm as documented during presence of hyperkalemia . On the other hand, many patients on chronic atrial fibrillation show an absence of P waves, which was consistent with an atrial paralysis and an idioventricular/idionodal rhythm with an escape aberration. Although hyperkalemic paralysis has been reported, it represents a rare event. In these patients hyperkalemia was likely due to chronic renal failure associated with spironolactone therapy. Spironolactone induces hyperkalemia and a number of cases of iatrogenic hyperkalemic paralysis has been reported [9,10]. The prognosis for patients on chronic renal failure treated with spironolactone is usually favourable since treatment with insulin and haemodialysis lead to complete regression of clinical picture. A sudden onset of neuromuscular involvement in patients in treatment with ACE inhibitors or spironolactone should suggest acute hyperkalemia and a careful examination of ECG changes i.e. arrhythmic complications, should be carried out. Excessive amount of cation causes a rapid increase in extracellular potassium level which alters [K] e/[K] i gradient thus reducing negative ratio with possible onset of hyperkalemic mediated disease. The disease includes paresthesias and muscular weakness, flaccid paralysis involving limbs and then trunk muscles, typical ECG changes and arrythmias. It is worth noting that more rapidly installed hyperkalemia is associated more serious derangement of heart. It is also clear that a moderate increase in K level requires more time to shift from significant hyperkalemia to threshold values (8-8.5 mmol/L) leading to malignant events such as asystole and VF.